Online shopping is everyone’s favourite way to shop these days, whether it’s TVs, books, jewelry or shoes. And while It takes plenty of shipping prep and know-how to get those items to a customer’s door, those items won’t be showing up alone. With so many stores online, and more popping up every day, it’s more important than ever that your shipments stand out from an ever-growing crowd of kraft boxes and kraft mailer envelopes. How do you do that? Easy, you customize and brand your packaging. And what’s a great way to do that while saving on shipping costs? Glamour bubble mailers. Trust us, you’re going to love them. Glamour Bubble Mailers: What are they? They’re a part of the mailer envelopes family—but they’re fancy. Instead of being made from the golden-coloured kraft paper or brilliant white poly material we all know and love, glamour bubble mailers are constructed from shiny, metallic material. Available in a wide array of colours, they stand out from those kraft and poly mailer envelopes. There’s no way a customer misses them, and there’s absolutely no way a customer isn’t clamouring to open one as soon as they get it. While their outside maybe be different, glamour bubble mailers are just as well-protected on the inside as their less-flashy siblings. 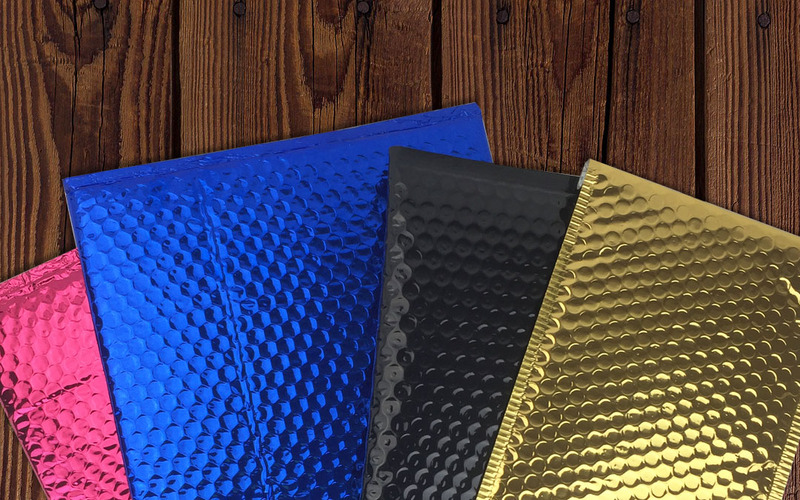 Lined on both sides with bubble cushion, they provide the same protection and cushioning as other bubble mailers—they just look a whole lot better while doing it. Plus, they also have the same self-seal adhesive strip for easy and secure closure. Glamour Bubble Mailers: Why use them? Short answer? They look great. Slightly longer answer? They’re going to leave a lasting impression in your customer’s mind, and that’s ridiculously important in today’s crowded e-commerce market. They’re a higher buy-in than other mailer envelopes, because of their metallic outer casing, but the ROI (return on investment) can be immeasurably high. How many times have you received a kraft box or mailer envelope and stopped to wonder who it came from? On the flip side, how many times have you ordered from a store and instantly recognized the shipment because the packaging was coloured or branded? There’s no doubt a customer will know a shipment’s from you if it’s glowing with a bold and shiny metallic colour. You can’t buy that kind of customer recall and recognition any other way. Plus, with delivery companies charging by dimensional weight, you’ll be looking to reduce your shipping budget any way you can. Just like their kraft and poly siblings, glamour bubble mailers cost less to send out to your customers. They truly are a win-win packaging supply. Glamour Bubble Mailers: Can you brand them? Absolutely. After you’ve chosen the colour of your glamour bubble mailers, all you need is a custom label or sticker. It could be a shipping label designed in your brand’s style and typeface, a simple sticker with your logo on it, or anything you think best represents your brand. It’s yet another way to catch a customer’s eye, reinforce who you are, and make yourself stand out from the competition. Don’t forget that how you use that custom label is just as important as the label itself. Do you place it directly in the center, in a corner, or across the closure flap? The choice is up to you, and whatever works best for your branding, we say do it. TPC Tip: Want to take your branding even further? Think about using custom tissue to wrap up the items inside. Printed with your logo or design motifs (and even secured with another label), it’ll reinforce your branding yet again, and make customers smile even more. The world of e-commerce shows absolutely no signs of stopping, and neither does your competition. If you want to stand out, impress your customers and even save on your shipping budget, glamour bubble mailers are a flashy and effective addition to your packaging arsenal. When you’re ready to go loud and shiny, The Packaging Company has the glamour bubble mailers lineup your online store deserves.